So all my friends back in SF are actually at Burning Man right now, the man's embers are probably cooling as I write this. I would have loved to be there, but I chose months ago a plan that I knew would result in me not being there. Twice in a row is enough, it was time for a year off anyway. A friend of mine apparently made the same choice this year, even though he's in SF: he stayed home and looked for other things to do. And that apparently included Balsa Man, the 1/16 scale version of burning man. The Balsa Man is 3 feet tall, the gathering lasts only a few hours, the art is tiny, and the art grants are even tinier! Check out his two posts: Come to Balsa Man, the 1/16 scale version of Burning Man and Balsa Man projects complete!. 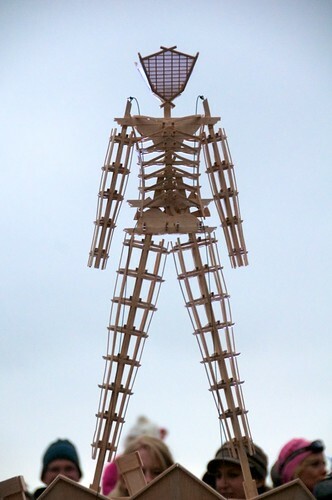 Also, check out Karen's flickr set of Balsa Man 2010. I just love the whole idea of a tiny burning man, pure genius I tell you! And it looks like they got ~200 people in attendance, also pretty close to 1/16!